Overcasting/ stitch lock is where we run a thread in between each or every few ( depending on the rug )warp thread, then up and over into the next best stable weft thread to stop your rug's fringe from fraying into the rug, stopping your rug from loosing pile. Weft threads run horizontal between each pile row. A proper overcast stitch (by hand) along the end of a rug will anchor the knots in place so that they will not “slide” off of the warps. This is a simple looking stitch (either a buttonhole or cross-stitch variety), but knowledge about how to properly anchor the stitch to a weft thread is key. 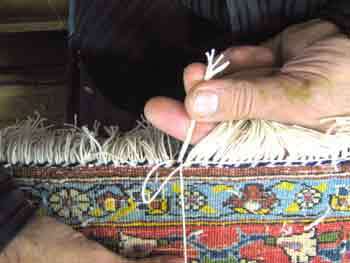 A poorly executed stitch will lead to a tension inconsistency that can result in additional knots unraveling from the rug. 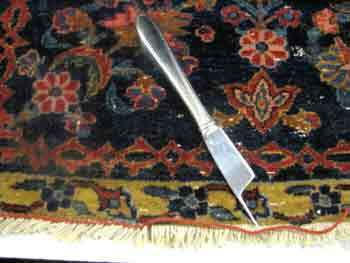 A minimum of an inch of original fringe (exposed warps) tassel is needed for a correct overcast stitch, and it is ideal to have one consistent row of knots to anchor together from left to right – this many times means that the rug must be evened out beforehand to prepare it for the overcast stitch. With the proper conditions met, this leads to a superior overcast stitch. This service should then last and never have to be redone (barring some extreme damage such as from a vacuum or a dog’s teeth). 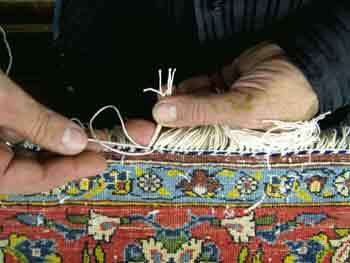 It is the one service that we guarantee for the life of your rug.